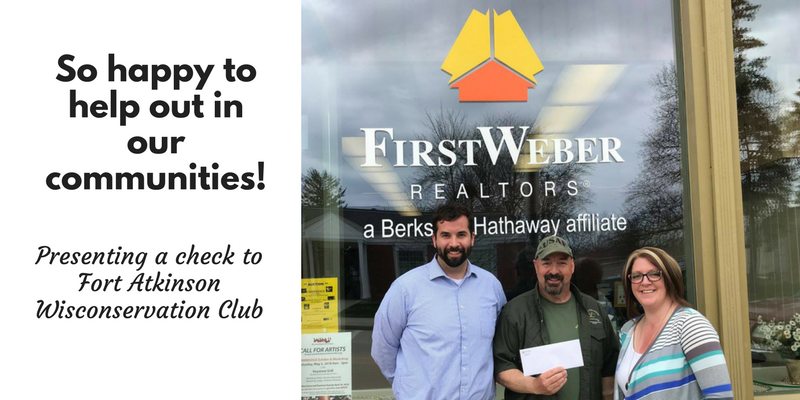 Lori Jensen & Becker Realtors had the privilege of presenting a donation to the Fort Atkinson Wisconservation Club in appreciation of their continued efforts to preserve our outdoor resources. Back on March 1, 2018, the club posted photos of dumping that was taking place along the Rock River. Their efforts to raise awareness to the issue and help to keep our environment clean, urged us to show our appreciation. Not only do we live here, but we love showing others why this is such a great place to call home as well. The work of outgoing organizations, like the Wisconservation Club, makes our jobs that much easier. Thank you for voting First Weber a Top Workplace for the sixth year in a row!